I am thankful for so much! Eyes to see, ears to hear, a heart to love, family, friends, laughter, and the time to weave them all together. I’m thankful for the support of my manager and my co-workers. They continually motivate and inspire me. I am thankful for my family and this wonderful small community of Benson that I get to work and live in. I am also thankful for this great nation and the freedoms we get to enjoy each and every day. I would like to thank all employees for their dedication, hard work and safe work practices in 2016 to ensure that Arizona G&T Cooperatives remains at the top, as the preferred energy and transmission provider for our members. There will be continuing challenges to be met in 2017 and beyond, but we have a very strong organization with great employees as the core of our Cooperative to carry out the task! I’m thankful to God for giving me a wonderful family, great friends, good health, plenty to eat, and a roof over my head. I’m very thankful for all the military service men and women, who voluntarily put themselves in harm’s way to protect our way of life in the United States. Despite the difficulties our country experiences, it’s still the best country in the world to live in. We don’t have to look far to see just how much we have to be thankful for. I am grateful for the wonderful (and even the not so wonderful) experiences I’ve had in my life and the people I’ve met along the way. Being raised on a small farm in rural America, leaving to go to the big city (Los Angeles & Phoenix), and ending back in rural America has filled my life with adventures I never dreamt about. And I am grateful to look forward to the future because there are always more dreams to fulfill! I am thankful that I work among people who welcomed me as soon as I arrived here and have made me feel included ever since then. I am thankful for my health and for all of the possibilities that it provides. I’m thankful every day for my family, my friends, this amazing nation we live in and the freedoms we enjoy. for God and Country, for hearts that mend. 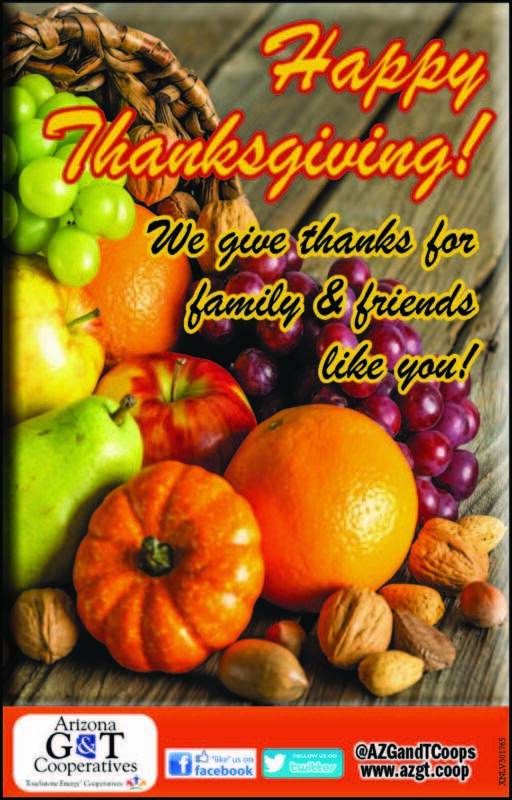 Check out our Thanksgiving greeting in the Benson San Pedro Valley News-Sun!